Investagrams is a one stop shop for Financial Freedom. It provides handy guidance for people who wants to learn how to trade and invest in the Philippine Stock Market. 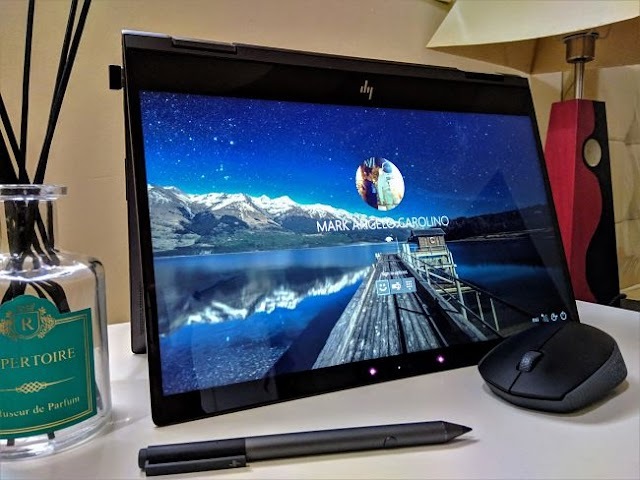 Not only does it provide guidance to its members but it also functions as a social networking site that connects people who have similar passion in stock trading and investing. It has an iOS and an Android app which function similar to its web counterpart. 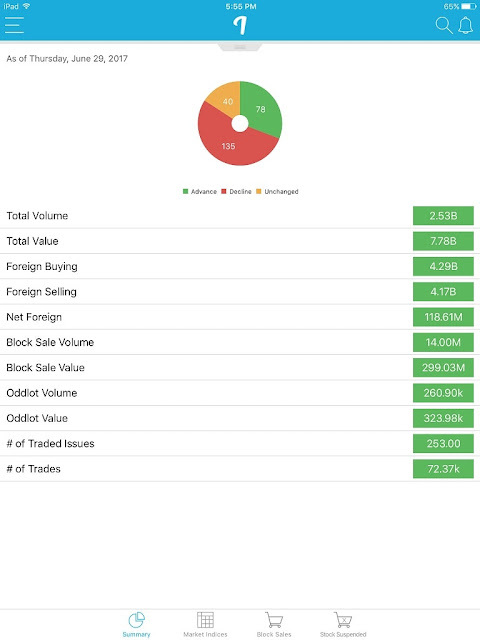 With the social networking feature of the app, members can connect to each other and talk about the technicals and fundamentals of the stocks they are holding and planning to hold. Personally, I am using the Investagrams app as well as the official trading app of my online stock broker for more than a year now. Both apps serve me well and help me monitor my stock holdings at any give time, anywhere. 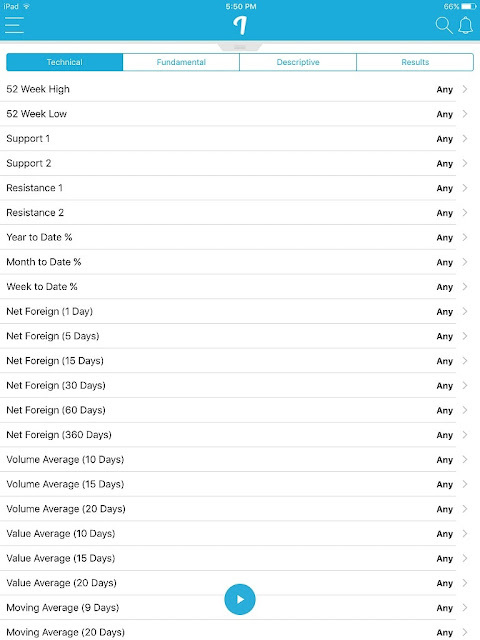 The app's various features also help me in analysing the fundamentals and technicals of the stock before I decide to hold it for a couple of months. Sometimes I do quick trade but most of the time I stick to being a position trader. This feature lets you scan and instantly filter out stocks based on your preferred options in just a few clicks. Just set the parameters of your technical indicators and the app will scan the stocks that matches the parameters you set. I am more of a technical position trader so i use the simple moving averages in filtering stocks. I also use the moving average crossover filter as well as the filter for the 52-week low price hoping that I buy the stock at a bargain price. For me, this is the most used feature of the Investagrams. 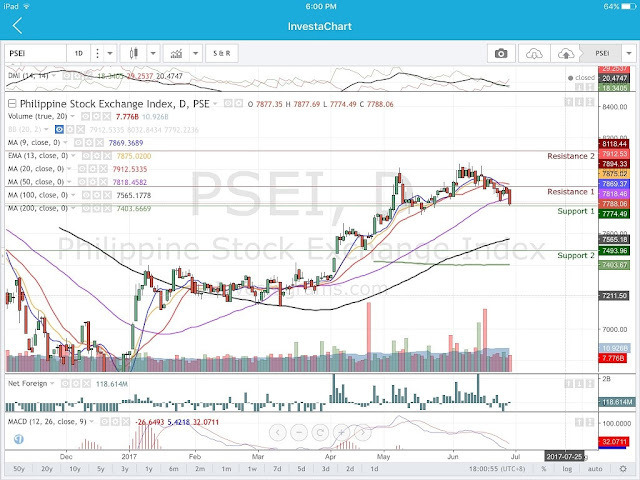 I prefer the charting tool of Investagrams than my broker's. They both use Tradingview platform but Investagrams provides many useful features that my broker can't provide such as the one button click for Support and Resistance lines, Fibonacci Retrancements, and the customizable ticker just to name a few. I can access the charting tool on PC, tablet or smartphone. I prefer to access it on PC because i am more comfortable browsing the charts on a bigger screen. If I am away from my PC, I am using the Investagrams app in my iPad and it works well just like how it is supposed to work using a PC. The app is very responsive. If both PC and iPad are not available, i can simply browse the charts on my smartphone. However, for a 5.5-inch screen of a smartphone, the chart looks very small but it shows exactly how the chart is shown in PC and the iPad without any lags. Once you become a member of Investagrams, you will become a part of an online community of investors or traders who are passionate about sharing their trading ideas. The social networking feature is user-friendly and it functions somewhat similar to Facebook. You can like, share and comment on posts and you can follow other members who share their technical and fundamental analyses and insights about their chosen stocks. You can connect and collaborate with other investors, traders, and analysts before making your next trade. I really thank the team behind Investagrams because of this feature. I have learned a lot and I am still constantly learning from the analyses and insights of professional traders who are generous enough to post their opinions on various stocks. It is where I first learned about how the market works. I had no clue why we needed to monitor the Philippine Stock Exchange Index as a guide before we enter a trade until someone from Investagrams community explained to me clearly how is it relevant to my trading activities. There is a lot more other topics about real-life trading that I have learned from other members of the Investagrams community. I believe that the best way to learn is to learn from the experience of others and that's what you'll get when you join the Investagrams social network. 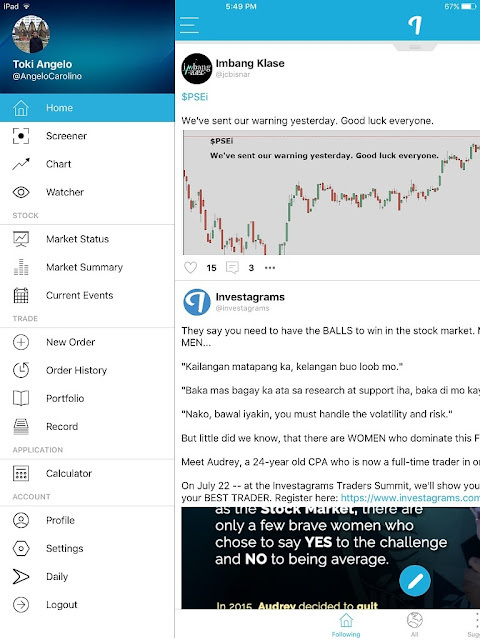 By using the Investagrams website and apps, you can get instant fundamental and technical analyses that will guide you on what, when, and how to buy or sell a stock. You can use this feature depending on the parameters you'll set when you filter the stocks for your next trade. As an investor or trader, making yourself comfortable with the technical and fundamental aspects of a stock is a good start for a profitable trading and investing journey. If you have no clue what are the fundamental and technical aspects of a stock, you can use Investagrams as your startup tool companion while learning the basics of Stocks Trading. When I was just starting, my desire to learn more about technical and fundamental analyses brought me to Investagrams website. At first I didn't know how to explore it because I wasn't well-versed enough to understand the technical terms used in the website. But by constantly logging in to the Investagrams website, reading its contents and interacting with other traders; I became acquainted with the site, its features and its members. I really like this feature because this feature let me instantly access my portfolio without constantly signing in to the app. Unlike my broker's trading app, investagrams doesn't ask you to sign-in multiple times to access its features. I understand that for security reasons, my stock broker's app need to ask my log-in information everytime I need to access my trading account event if I just want to see the current percentage gain of my stock holdings. 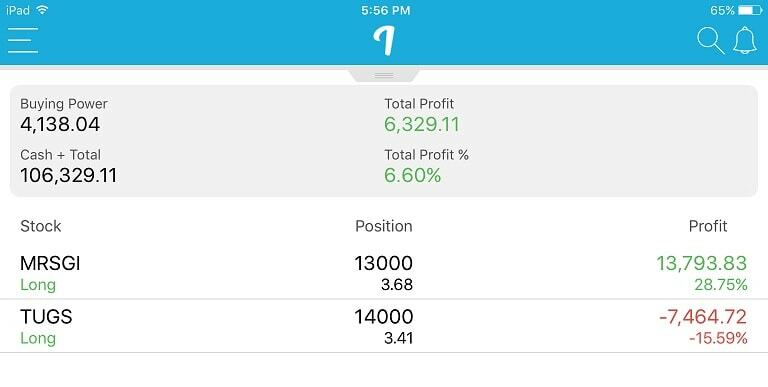 The Investagrams virtual trading feature makes a perfect partner for my stock brokers app to do small tasks like looking at the current profit or losses without opening my real trading account. If you're not yet into actual trading and you haven't signed up to any online brokers to get an access to the Philippine Stock Exchange, this feature can help you simulate the real-life stock trading using virtual money. You can practice when to buy or sell stocks to get yourself acquainted with the basics that you need to know [example: the charges when buying and selling stocks] so that you will be technically prepared when you decide to enter the real world of trading and/or investing. That's it for now. Let me know in the comments below if you also have an Investagrams account. You can also share this post to spread the good benefit of having an Investagrams account and invite more members to become part of the Filipino Investing community. The Investagrams app is available in Appstore and Google Play.